In the age of space travel, an American explorer is preparing to cross the Pacific Ocean from South America to Australia using a reed boat built by Bolivian Aymara Indians. The expedition seeks to prove that ancient mariners could have made such journeys across huge ocean expanses in reed ships, and that such vessels could have been a factor in human migration. 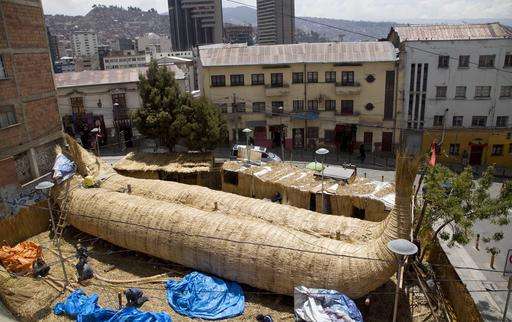 The nearly 60-foot (18-meter) boat was built in La Paz at more than 11,800 feet (3,600-meters) above sea level. 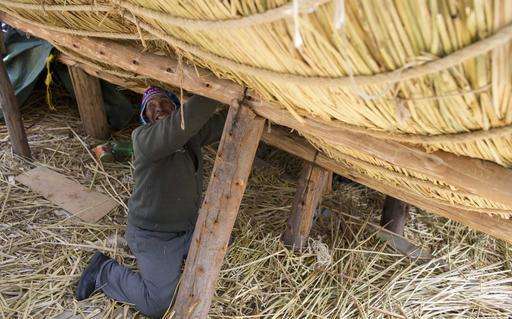 It uses techniques developed by the indigenous people of the Andes cordillera to ply the waters of Lake Titicaca. "This type of technology doesn't exist anymore; it's like an art form. I admire these people and their culture," said 51-year-old adventurer Phil Buck, who leads the project. The six-month expedition due to start in February seeks to cross more than 10,000 nautical miles from northern Chile to Sidney, Australia. Buck made a similar trip in 2000 when he used a Bolivian-crafted reed boat to travel 3,500 nautical miles from Chile to Easter Island. An attempt to reach Australia in 2003 was interrupted by damage to the boat. "On this second try, I'm sure we'll reach all the way to Australia," Buck said as he supervised the construction of the vessel known in Spanish as a balsa. "Such a distant journey has never been done before and the goal is to show how far these rustic boats can go." Buck said his dream of exploring the world began at the age of 11 when he read the best-selling book by Thor Heyerdahl about the famed adventurer's journey aboard the balsa raft Kon-Tiki. In 1947, Heyerdahl and his team sailed their primitive raft 5,000 miles from Peru to Polynesia in 101 days to support Heyerdahl's theory that the South Sea Islands were settled by ancient mariners from South America. 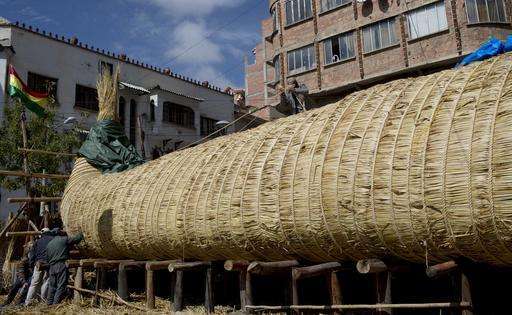 The Viracocha III was named after the supreme Inca deity who is believed to have created the sun and the moon on Lake Titicaca. The expedition's crew includes up to 10 people of different nationalities. They will navigate mostly by the stars and currents and will feed themselves with grains, including the Andean quinoa. 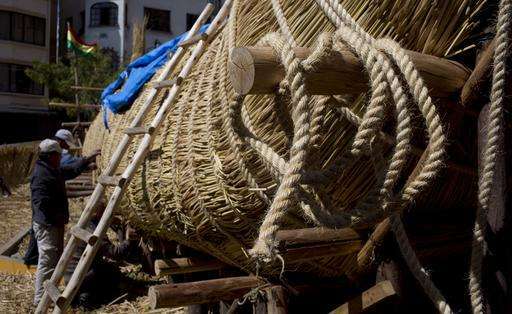 The three-masted boat was made from several tons of dried reeds of the totora plant. 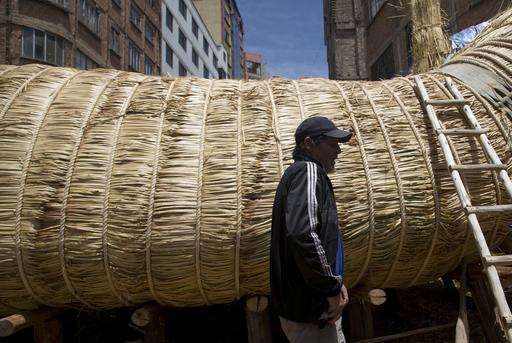 It will be transported on a trailer along more than 200 miles (320 kilometers) from the Andean highlands to the Chilean desert port of Arica. 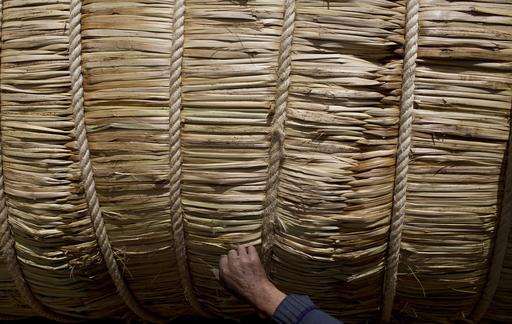 Seventy-one-year-old Juan Limachi has been building the reed boats since the age of 7, using the technology inherited from his Aymara ancestors. He now wants to retire knowing that his final work helped an expedition reach another part of the world. "This is my dream after building these 25 giant boats," he said.